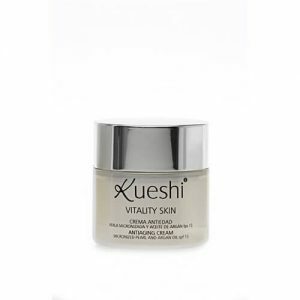 This facial cream protects and cares the skin and provides a versatile and lifting effect. This facial cream protects and cares the skin and provides a versatile and lifting effect. The exclusive formula prevents the loss of firmness, improves elasticity of the skin and protects the skin simultaneously. Also provides protection against premature aging due to sunlight thanks to the protective effect of SPF 30. The combination of active ingredients ensures a lifting effect, reduces the appearance of wrinkles and gives the skin a youthful appearance. How to use: apply morning on a clean and dry skin of the face and neck with a gentle massage until the cream is completely absorbed. Avoid the skin around the eyes.